Remember my 400th post giveaway? I discovered your blog about a year ago and have throughly enjoyed it. If I'm ever in the area I would love to check out the shop. It's a long way from Georgia but maybe one day. Congrats on the book, the new line, and #400! What a great reason for a giveaway! Yay! ﻿Email me your address and I will send you my book and some of my Sugar Snap fabric! Dude, I am such a slacker. I have a ton of emails that I haven't responded to and it makes me feel like a bad person. I will buckle down on Monday and attack the inbox, ok? 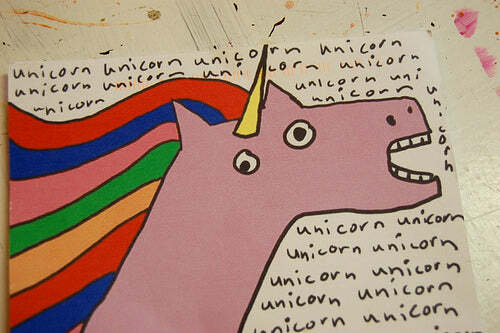 More evidence of my slackitude: This awesome piece of Anonymous Unicorn Mail that I got almost a year ago. So the image is from Natalie Dee this adorable webcomic. I emailed the artist to see if it was she that sent it (she? her? whatever). But she was all, " I have no idea what you are talking about." So I don't think it is her. Also, yes, I am assuming a female sender. Is that wrong? I mean, my first piece of Anonymous Unicorn Mail was from a dude, after all. 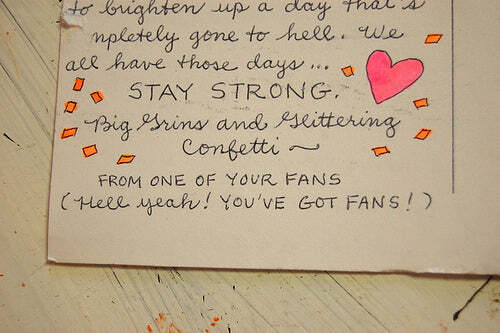 And doesn't this person have the awesomest handwriting? Jealous. This same person sent me another piece of Anonymous Unicorn Mail but I don't have pics of it. I have been wanting to blog it just in case that person is still reading and wants to know that I a.) got them and b.) appreciate them. Resounding YES, yo! Also, I have been a bit slacktastic with the exercise and eating well since my 30-day Bikram Yoga Challenge ended a week ago! Like, I may have eaten my weight in cheese the other night at Beth's. But, as of tomorrow, I am back on track. I will go to Bikram 4-5 times a week, run at least 3 times and hopefully hit up the Y for a couple of pilates classes. If you are in with me, feel free to state your plan in the comments for accountability! p.s. I kind of want to do my own webcomic.